1. 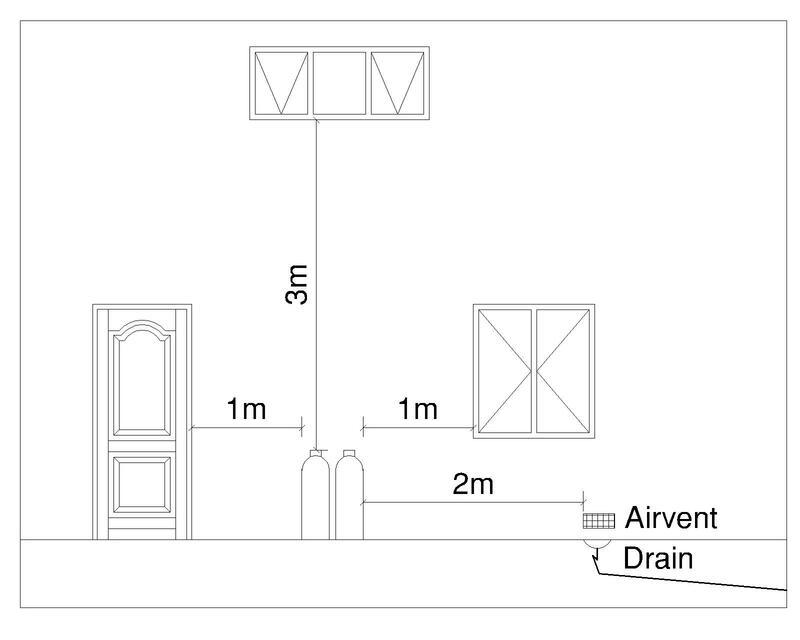 Gas Containers to be not less than 1m sideways from doors and windows. 2. Gas Containers to be not less than 3m below windows and doors unless a non combustible roof is installed between the containers and windows. 3. Gas Containers to be not less than 2m away from drains and airvents. 4. Gas Containers to be not less than 1m away from Property Boundaries unless the Boundary is a Firewall (only if 2 x 48kg bottles or less). If more than 2 x 48kg bottles are required then they must be at least 3m away from the Boundary. 5. Only Class 1 or 2 Copper Piping or approved gas piping is to be used. 6. All Copper pipes going through a wall to be sleeved. 7. Flexible Hose may not be more than 2m in length and may not go through and partitions including wood and drywalling.